Heya, folks! Just wanted to give you an update on the playtest document, specifically about the bard class. Bards have always been a problem because they’re designed as a support class, and when a support class has to fill in for a role normally occupied by a primary class (like a bard healer in a group without a cleric), they’re not as good at it as the primary class is. I wanted the bard to still be useful in a support class, but also give the bard the ability to make the other PCs even better at their jobs, so everyone in the group is glad to have them around. 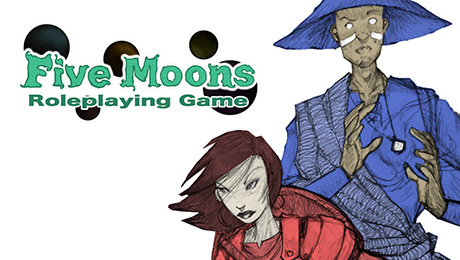 Five Moons RPG is a team game—the classes automatically support each other, like with aura abilities. For example, one of the warrior auras grants all friends within 100 feet the ability to spend a boost to reroll a failed weapon attack roll. Instead of bards having their own specific auras, they can pick any two class auras and grant those to their friends. Missing a warrior in your group? The bard can provide both warrior auras. Missing a wizard? The bard can provide both wizard auras. Thanks, bard! Bards also have a unique ability to “stack” redundant auras. Normally, if you have two warriors in the group, their “spend a boost to reroll a missed attack roll” auras are the same effect and don’t give you anything extra. But if you have a warrior and a bard providing that aura, if you spend a boost to use that aura, you get to reroll twice and take the best result. Thanks, bard! Bards also have a cool thing they can do with boosts. If you’re in a group with a bard, and you’ve run out of boosts, and you really want to (or need to) spend a boost on something (say, to save your life), the bard can let you spend one of theirboosts on whatever ability you’re trying to activate. And at levels 5/10/15/20/25, the bard gets extra “friend-only” boosts per day that only work with this ability—basically increasing the number of daily boosts available to the entire party. Thanks, bard! That sounds pretty good without trying to turn the bard into a second rate everyclass solo act. I like Auras, but they feel a bit disassociated from the game world. For a mechanic designed around teamwork, it feels weird that it takes little to no investment from the aura’s owner to utilize it. A 100 feet is pretty far away, and it seems like the other party members do not need line of sight to the aura bearer or to even be aware they’re around. The most a player has to do is (out of character) remind the team they have the aura in the first place. I’m not suggesting a player use up their action economy like Aid Another. If the fighter is helping me swing a sword better, I expect he has to at least be within earshot of me and can’t just watch TV in his room on the opposite side of the house. While I imagine it might require line of effect (so no being on different dimensions, or blocked completely by solid wall), can think of the situation less like that, and more like if the party got split up, and remembering the lessons of the fighter of before. Since its assumed they’ve helped trained together, and watched each other fight long enough. It’s fitting you mention Aid Another as well, since the team-game article did remind there was some kind of special Aid-Another action that’s going to exist. Unless that was just further compounding upon the Auras that a given class grants (which it heavily indicates is the case). That’s deliberate. I want it to be always-on so your character can use it whenever–without bookkeeping of tracking whether or not the character has activated it on you or not. That’s also why they’re minor abilities (rerolls) and why they don’t add plusses to anything… I didn’t want people to have to rework their character sheet or bonuses in response to the auras. Deliberate and deliberate. Less bookkeeping if you don’t have to track if the character is 25 feet or 30 feet away, or if the character is around the corner or not. You get the benefit from having that person on your team, and you don’t have to fret about minor details. Hm, I see! I don’t really see 30 feet as difficult to track. Or having to be close enough to hear or see the ally. But keeping it simple like that makes sense. I really like Aryxbez’s suggestion, too. That makes sense. It actually leads me to ponder if maybe readying abilities tied to this? Instead of a proximity restriction, perhaps an ally simply has to spend time with you as you ready abilities? All classes now prepare their abilities, so it makes sense if the central teamwork abilities relied on a common activity. Maybe NPC boons could work this way, too? When readying your feats with an NPC that you hired to train you how to fight against undead, you get a boon where you can spend a Boost to reroll a resist against an undead creature for 24 hours. I once designed a harrow deck themed archetype like this. The character has to perform a harrow reading each day when regaining spells (real-life reading not required). They get Harrowed as a bonus feat, but she can choose to grant the bonus from the feat to anyone that attends her harrow reading. It’s a fun little character connection that opens roleplaying opportunities. It isn’t… unless you’re in a room that’s 40 feet across, which means some PCs are in range and some are out of range, and people are quibbling over 5 feet of distance (and counting diagonals three different ways to make sure they’re doing a legal move). It’s just easier to give them a longer leash. Hm, a good point. On that note, I’m curious what you think about categorizing distance like how Numenera and 3rd Edition spells do. I kind of liked that in Numenera, even though I’d still use a grid if I ever had the pleasure of running a Numenera game. Come to think of it, even the one guy in my group that plays war games hates how 3rd Edition deals with diagonals. I’m not quite ready to take it as far as Numenera does with its close/intermediate/long distances, but the Combat Basics chapter’s default assumption is gridless, and it does tell you that if a creature is “about 30 feet away” from you across the room, it doesn’t really matter if the creature is really 25 or 35 feet away, just let the player spend the 2 AP (speed 15 x 2 = 30 feet) to move over to the monster. It’s because they’re wacky. I understand the why of it and the math of it (and I don’t really like 4E’s square fireballs), but counting them does slow down the game. Gridless as the default? Interesting. I always liked to picture 4th Edition fireballs as literal cubes made out of flame. I know you said “Both” [Class] Auras, but can a Bard still pick an aura from one class, and the second aura from another? (So if bard wanted a Warrior & Wizard aura, it could?) Also, does this mean it can have spellcaster spec-specific aura (so it can pick the Necromancer-only aura, without being one). Speaking on Funny note, Party of 4 Bards w/same aura for that reroll would allow it to be rerolled FIVE times…funny coincidence of theming there. Lastly, I noticed in the pre-alpha playtest for Necromancer aura, it mentions “against an effect that would kill you (such as a death spell or a deadly trap),”. Does this mean Save-or-Die effects are going to be in Five Moons, including traps do the similar? So Overall, I really like the idea here for bards, it seems very interesting. 1) Can a Bard still pick an aura from one class, and the second aura from another? Yes, you don’t have to pick two auras from the same class. 3) “It does sound more likely that Bards will be ‘Stacking’ auras, opposed to picking ones the party doesn’t have.” Possibly… depends on what sort of encounters they’re facing that day. Is it more important today to get double Will rerolls against spells (stacking wizard aura), or to get single rerolls on melee attacks (replacing a missing warrior aura)? Depends on what you’re fighting, what their powers are, and how tough they are. I kinda had that sense as well, though their auras are really specific, and their specialization locks them into their 2nd Aura choice more or less. Considering the variety of feat choices, its not as likely PC’s will take those feats with their own slots. While they could “Train/earn” said feat(s), they’d still only be active on a boost, making them not as likely to be “readied” for that day (more options is nice, but we should avoid bloat). Though whether or not the Bard should be able to choose them, is if the Feat versions will be stronger than the class ones or not. If about the same level, then not really much harm letting the Bard choose them like with any class. Sure, that means down the road the bard has more Aura options, but they still require a boost and are specific in nature. IF they’re in fact stronger than class auras, then I imagine can see it being unwise to let the bard’s Aura choosing ability “scale” over time, possibly exponentially with super Auras. However, if you like the design of Bards getting better auras than everyone else over time, or it seems some of his abilities stagnating w/future releases, then may amend to say otherwise. Though, I understand may want to remove that particular ability with the others, but all the same I figured I should ask it. Traps, maybe, as in 3E they’re really only minor obstacles. But so far with monster abilities and spells, anything in the SoD or SoS category is something you can spend a boost to reroll your resist (if you have the right aura in your group) or try again on a later turn (like how Hold Person lets you save again each round, but Five Moons would require you to spend a boost or Resolve to do so). I don’t think it would hit diminishing returns, I think it would hit a hard cap almost immediately. Take hit for instance. If average monster AC is 15 and average player hit is +8, that’s 70% hit. If an average d20 reroll is +3, then you’re theoretically at 100% hit with 2 rerolls (which is already over the max of 95% since 1s always miss). So just having a bard to stack one time puts you theoretically at max. Skills are the same, if the DC is 15 and the skill is tied to your main score. That said, it seems a bit too indispensable to me. It seems to me that people will be very inclined to do whatever they can to stack for successful rolls, which means someone will *have* to be the bard, just for stacking rerolls. I think Sean would say “getting to 100% success isn’t that big of a deal” and I’m inclined to agree. Except that it’s only possible with a bard. Funny. But on the other hand class stacking shouldn’t be the name of the game. It seems to me the default party comp will be all bards so the party can cover every base and have them all be at 100% success (or as near as possible). Since the game allows you to basically use any class to create the character concept you want, and since bard mastery will almost certainly be “assign your +5 however you want,” it seems like a small sacrifice to make any concept out of a bard, just to get the stacking rerolls. One last reason I don’t like stacking rerolls: I don’t like stacking *anything. * Moving from PF to 5e really shines a light on how the game doesn’t have to be in terms of piling on bonus after bonus, and I’ve grown pretty comfortable with the anti-stacking approach. It makes everything in the game easier and faster, and really cuts down on the min/max approach to playing the game. Ultimately I don’t think reroll stacking works. Fortunately, I think it could just be removed without harming the class. Being able to choose any aura and provide extra boosts is still pretty awesome, and I don’t feel bards would really be lacking if that is all they bring to the table (although the extra boost thing might be better if it started right away at level 1). The actual math on that is very complicated, but its fairly indicated the RNG breaks once ye got 3-5 rerolls going on. That said, it’s a very limited combo, so while it exists, doesn’t seem like something to worry about as we know. While Dumpster-diving as default is bad, and punishes new and casual players not willing to go through that effort, 5e’s isn’t a real solution. The system itself while ok in theory, doesn’t replicate well multiple circumstances in an ongoing encounter (much as two circumstances doesn’t really represent well). On the “Advantage” side, once you/party has it, no incentive for rest of the party to try granting it to others, or do anything cool to acquire advantage. Optimization in any game, even on the basic level, will be encouraged more or less. Such as a fire mage is going to choose fire spells, options that increase the potency of that fire magic (be it versatility or raw power). Speaking every 5 level boost options, made me wonder if other classes going to have benefits on that schedule? Sounds like the Warrior/Wizard/Rogue would probably have extra boosts only for Cronks/Spells/Stunts respectively. Although It’ll be interesting to see what the remaining hybrid archetype(s) get for their extra-specific boosts. Remember also that Five Moons sets the bar lower for what you need to roll to hit someone; your default options are usually “try an easy attack roll for a normal hit, or take a –5 on your attack roll for a special hit like Power Attack.” So your typical fight isn’t going to have a lot of misses if you stick to basic attacks… but you’d take a risk for something cooler, or against a “boss” creature. Bard mastery *is* an “assign your +5 how you want” ability, but only to skills. So you can’t add it to weapon attacks (like a warrior can), spell attacks (like a wizard can), or mix and match it between weapon attacks and spells (like a rogue can). So a group of all bards is going to have a slightly lower sucessful hit rate, which means they’ll have to rely on their boost rerolls more for getting attack-based special abilities to work, which means they’re quickly going to run up against the 5 boosts/day limit. Whereas a warrior is hitting with weapons most of the time because of their automatic +5 weapon attack bonus, a wizard is hitting with spells most of the time because of their automatic +5 spell attack bonus, and so on. Yes, you can create an all-bard party for a specialized purpose, but the class is meant to augment, support, and be a backstop against trouble, not to replace all of the primary roles that the other classes perform. Actually, if the other four classes are in your group, then not allowing the auras to stack would mean the bard’s aura ability does NOTHING. Which would mean that the bard’s ability is useless, which is sad. The stacking rerolling isn’t really a big deal (in terms of increasing power), but it does keep that bard ability from being totally useless in a mixed group. Yes, but that is the whole point. You either have advantage or you don’t, and the beauty is the DM gets to decide if what you’re doing is “enough.” It’s not a binary mechanical thing, it’s a judgement call. Which means it actually IS to your benefit to keep trying to gain advantage, to present a better case to the DM why you should have it. Your explanations definitely make things make more sense. I had assumed bard mastery would mirror rogue mastery. I had also assumed there would be more auras to choose from per class (I don’t know why). That’s what I get for assuming things! But at the same time, there still seems to be something not right. If you have two warriors in the group and no bard, one of the warrior’s auras do nothing. So why, in a much less likely scenario (having one of every other class in the group), do the bard’s auras get special consideration to remain useful? Groups without bards will inevitably have useless auras, and the only solution is to add a bard. That strikes me as a problem. One solution would be to remove aura stacking and accept that people will sometimes have useless auras and that this affects everyone. A better solution might be to have each class choose their auras from multiple class-appropriate auras, with the bard still being able to choose from the entire list. Which raises the question–do characters really need to have two auras? Would one suffice? If every class had a list of say FIVE auras and they could pick one, redundancy wouldn’t be a problem. Once you’ve secured Advantage for yourself (and other PC’s the similar), no clamoring from the DM is going to increase the advantage (since Advantage don’t stack, and yes, pun intended). When I sit down to play a game, and the game can’t decide if one of its central mechanics applies/works or not, then that’s a problem. Especially since such game is something expected to plop down money for (30-50 pending venue got it from). However, I digress talking of 5e. When was this indicated from SKR? I recall him definitely saying in the pre-playtest that there were going to be more Aura choices for each of the classes. Though I’ll mostly await to figure this out in the playtest, what is that bar exactly? I know of the +5 to hit from Warriors, or +0-5 from Rogues, Base AC of 5, but not sure what the actual RNG, success percentages and other math of the game will be like. You’ve already addressed the increased attack bonus and the lowered base Armor Class. Together that means a typical unexceptional attack is almost guaranteed to hit. That means you’re not having to deal with frustrating misses against most CR-appropriate opponents, especially at the lowest levels (where your attack bonus might be +5 but your opponent’s AC is probably 14–16, meaning you miss about half the time, wasting a turn). Because the bard doesn’t have an aura of its own, it only emulates other class’s auras. In its role as a strong support class, if you don’t allow its auras to overlap, it loses an important aspect of being a support class. Yes, the two warrior’s auras don’t stack, but the warrior isn’t a support class. Basically, a warrior’s aura is secondary to what it’s supposed to be doing (being awesome with martial attacks), but a bard is *supposed* to be giving you more and better supporting options. That is a possibility… but there’s only so much I can do to create cool/useful reroll options for the classes and I’d rather not end up with some lame ones like the Knowledge reroll aura that’s in the pre-alpha playtest (because you’d almost never choose them when you have better choices available, even if they’re free). Thank you! That’s what I needed to hear. I keep thinking about their abilities in a vacuum rather than part of a role. That makes complete sense now. I keep forgetting you said that. So that means my attack math should have been vs. an average AC of 10, not 15, right? That would be 90% hit on average on normal attacks. One reroll would cover the last 5% possible, and further rerolls would be useful only if you’re extremely unlucky (rolling a 1 or 2 twice in a row, a 1% chance). That changes things. It means the bard’s extra rerolls are only useful 1% of the time. But that’s compared to rerolls in general being useful about 10% of the time, so I’m not sure if the bard’s 1% is actually low or just looks low. I was thinking about that after I typed that. Martial hit, weapon damage, spell hit, spell damage, initiative, resists, skill checks, heals, even AC (+3 AC boost) and HP (say +1 per level temp HP boost), could all be reroll auras. The lameness factor would creep in depending on how thinly you try to slice things, specifically resists and skills. A specific skill or resist reroll would only rarely be useful, compared to most everything else which is almost always useful. Even healing, depending on how you ultimately decide to deal with that between encounters, could be very useful. And then you could flip all of them around and make auras that impose rerolls on opponents. That would get you 20 auras. If some aren’t good and need to be culled, cull them down to 16. That would hopefully be enough viable auras to virtually eliminate redundant auras. I feel a little confused by this, I guessing your example is referring to PF or D&D? Because if +5 is the expected average vs 15 avg, that would be a 50/50 chance of success. If Base AC of 5, then an uninspiring attack would be hitting on a 5+. If we’re going for 5+ as the default, with 100% essentially for Warriors, such, then you would subtracting 5 from those values I showed. 5th= AC 14/9, 10th= AC 18/13, 15th =21/16, 20th=25/20, 25th=28/23 respectively, Latter of the two would be the preferred AC to maintain 5+ for everyone, and 100% for Warriors/Wizards/Devoted-Rogues and junk like that. I understand if my math is wonky, as I’m likely basing it on confused assumptions. I also know its missing many other things (like resist rolls, HP expected of monsters, etc), but I’ll have to wait till the playtest to finally get a detailed look of these. I would like to note, if ye would be able to give a transparent account on the expected percentages/chance of success, and such would be deeply appreciated. As the final numbers themselves, can/will easily be prone to change pending how well they end up scaling (though I assume that parts already been done, so I’d be making sure at that point). I haven’t been around for some time so forgive me if I say something that has already been covered or is redundant for other reasons. I am one of those people that have had the Bard as my favorite class for years and years. A lover of the Bard, even though no edition so far has got it right. The closest thing to what I would like is the 5e version. So here wall of text on some of the mistakes PF made that I hope you don’t repeat. As you know in Pathfinder a wizard can’t cast spells or use knowledge check without holding his spell book and this is nuisance. Also clerics can’t fight unless they are holding their holy symbol. This makes Clerics problematic because they can’t use shields or use two handed weapon. This is especially disappointing since there are no holy symbols that can double as a weapon. Also fighters can’t use intimidate or any social skill unless they are wielding a weapon. ….. no, hang on this was wrong, but for some odd reason Bard is one of the classes, if not THE class, where fluff is mixed with mechanics into a mess. In some areas PF has made this less problematic, but it is still something that PF hasn’t been able to shake. They can’t cast silent spells, versatile performance is a mess, The Bard must perform, but they still can’t quick draw a musical instrument and there no master work or magical instruments that is worth getting. In fact I can’t recall seeing any bard actually using an instruments in a PF game. All have used Act, Comedy, Sing, Oratory or Dance. Speaking of Versatile Performance, in Numenera Rogues just changes class skills from day to day. That is cool and good Mechanics. Sometimes keep it simple is better. So, don’t mix fluff and rules. It only leads to sloppy and unclear rules, as in the case of the PF Bard. — Kill the dude with a lute!!!! Bard is no good in a small party, he is always the 5th wheel. Don’t make the same mistake. PF treat the bard as a full caster, even thou the class isn’t a full caster. Make him a full caster or make something else and don’t treat him as a full caster if he isn’t. Also, make the Bard a jack of all trades when it comes to spells. Let him pick spells from other classes at some levels. 5e got that part right. Recourse management is a hell at lower levels and a joke at higher levels. Don’t fall in to that trap. Activating bardic performance at lower levels isn’t worth it. Casting spells or attacking is far better. In fact setting up a flank grant more bonuses and really help the rogue. Simple fix is let the bard activate it as a bonus action. Also, as pointed out above, recourse management is a hell so attacking is usually better a lower levels. Rounds per day mechanics may make sense in combat, but is crippling the bard out of combat. The Bard giving the rogue a bonus when she is trying to pick up a lock? Sorry the lock takes 8 rounds so you can’t and you only have 7 rounds left, And what about Odyssey and the Siren? Wouldn’t it be cool if a Bard could have fixed that problem with countersong? A bard could have done that in 3.0/3.5, but the PF bard could not. Rowing a ship past a Siren would have taken far to many rounds. A lot of the bardic performances should have been Immediate Action, such as countersong and distraction. If you gonna use similar mechanics please let some be activated as reactions/ Immediate Action. The Bards bread and butter in PF is inspire courage and the bard really doesn’t get any real good new Bardic performances at later levels (except for possibly Frightening tune, but anything with a DC will be problematic since a bard needs to spread his/her stats so you can’t build a bard with a casting stat as high as a full faster). Please make the bard more flexible. Bards are not permitted to have multiple performances active, so at higher levels bards still stick to inspire courage, because Inspire greatness or inspire heroics are far from good. Why a high level Bard shouldn’t be able to blend performances is beyond me. Don’t make the same mistake. Archetypes get the good stuff, so you can’t pimp your core Bard (or any class). All the cool stuff you wish you could pick as feats are buried as abilities tied to specific Archetypes (fighters, among others, suffers from this problem too). I for one hate the Archetypes in PF. If you are going to use Archetypes I suggest you check out D&D 5e. An Archetypes should not strip you of abilities it should give you more abilities. Anyway, I trust you are going to get this right. So far 5M has fixed pretty much everything that bothered me with PF. Have a nice weekend and best of luck!